I include these stats to show that my students are just like yours. They are normal kids who hail from working families, many of which are single-parent homes. My students are over-achievers and under-achievers, bullies and victims, outspoken and quiet, struggling readers and proficient ones. They are no more or less responsible than your students. My students are not perfect, and they do damage and lose library books on a pretty regular basis. Yet despite all that, I am more than happy to lend $80 playaways to students. Even better, in the four years I've circulated playaways to students, I have only had one lost playaway (student paid for it then found it a week later) and one broken playaway (broken when we received it; vendor replaced it immediately). In all that time, I have never had to replace a playaway with my budget. PLAYAWAY PERMISSION FORMS: Library purists would say that I am limiting access by requiring parent permission for a student to check out a playaway. But as a parent, I would want to know if my child were checking out an item that cost up to $80. I think parents have the right to decide a particular type of item is just too expensive to replace, especially if they know their child frequently loses things. Teacher permitting, students who do not have permission to check out playaways can still check them out for classroom use only. In this case, the playaway stays in the classroom. For students who do return the permission form, I input a YES in our "EWMS Playaway" field in Destiny (we used one of our "User Defined" fields). The screenshot below shows an example from my catalog record. This way, I don't have to pull out a list or dig through a stack of forms every time a student wants a playaway. I also keep the alphabetized forms in a file folder. Once they return the form, they have permission to check out playaways as long as they are students at our school, unless the parent notifies me otherwise. 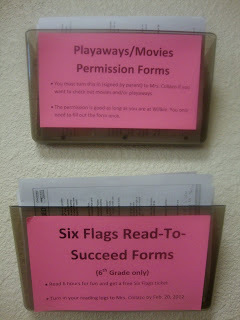 I keep extra playaway permission forms in a clear document display by the library doors. Students who decide to get playaway permission mid-year can easily access the forms without even having to ask us. CHARGE FOR REPLACEMENT PLAYAWAYS: Students who have to replace playaways are charged a maximum of $40, even if the playaway costs twice that. I call this the cost of doing business since I worried that parents might be hesitant to sign the permission form if they knew they had to pay the full cost of a playaway. After checking playaways to students for four years and never having to replace one, I am okay with subsidizing the difference if I ever need to. 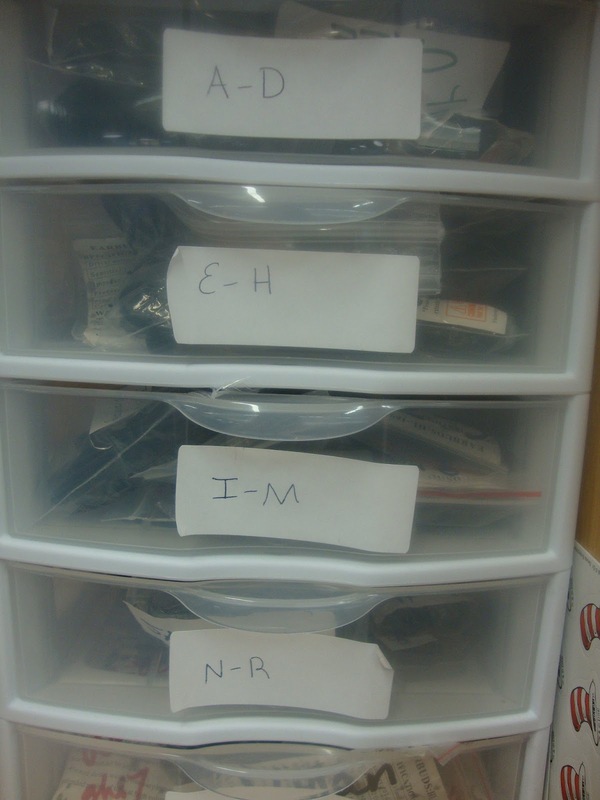 ORGANIZATION: Though our playaways do come to us with a call number, we do not use it. Instead, we assign a number to every new playaway we order, starting with #1. We currently have up to #92, meaning we have 92 playaways. The number has nothing to do with the call number or the barcode. We add the playaway number to the title field in the catalog so we can easily locate the playaway on the shelf. 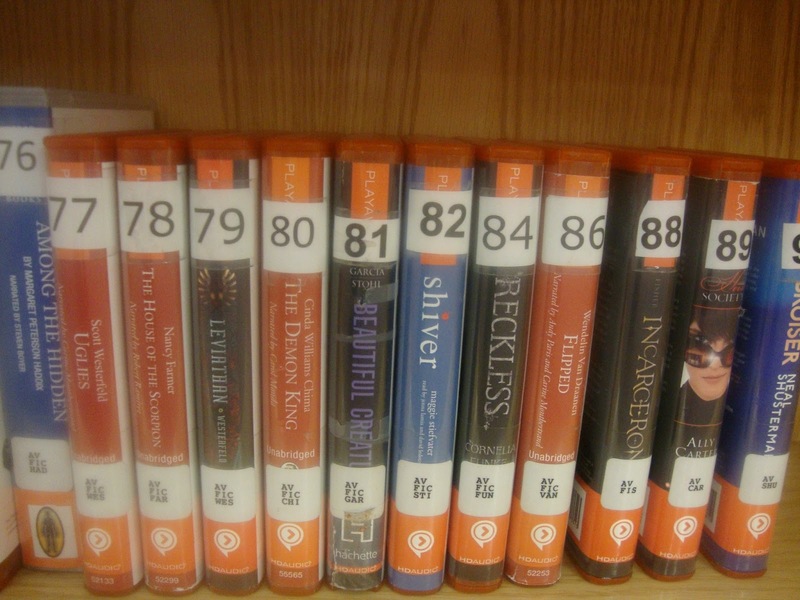 Yes, our fiction and nonfiction playaways are mixed together on the shelf, but this system works for us. Most of our playaways are fiction titles anyway. We print each playaway number on three separate stickers. The smallest sticker gets taped to the playaway itself (on the battery cover). This helps us quickly identify the playaway by number. One larger sticker (we use precut spine labels) goes at the top of the playaway case spine. 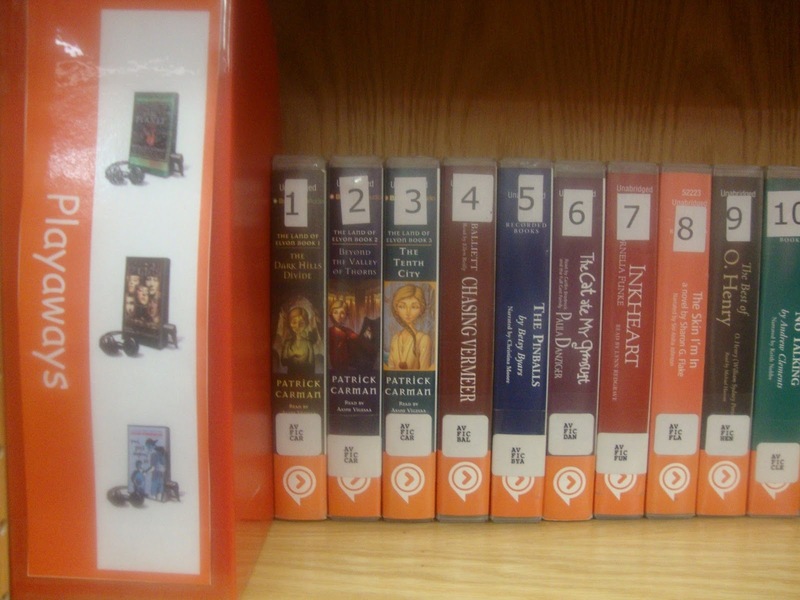 We put the playaways in numerical order on the shelves, and this number also helps us quickly locate the correct playaway in my office. The other larger sticker goes on the wall in my office, where the playaway will be located. 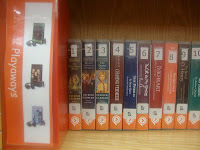 The first year our school was open, we tried shelving the playaways with books in their respective Dewey sections. We found that the playaways hardly got checked out at all, and students wanting a playaway had to browse the shelves to find one. Once we housed the playaways together, circulation increased dramatically. 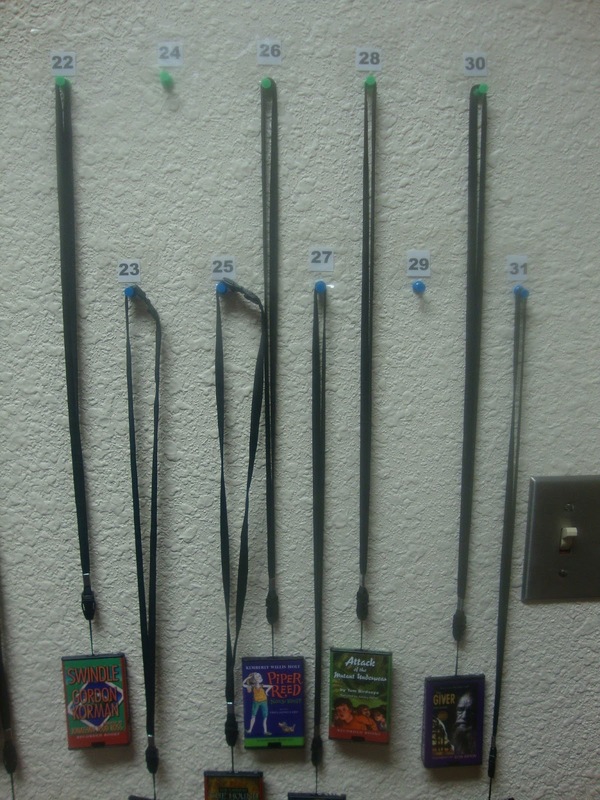 STORING PLAYAWAYS: We hang the playaways on lanyards (included with each playaway) and hang them from pushpins on the wall in my office. 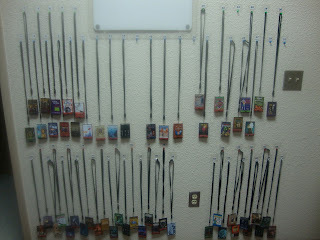 Just above each pushpin is a number that corresponds with the playaway and its matching case. Storing them in my office (instead of on the library shelf inside the case) helps to deter theft. CHECKING OUT A PLAYAWAY: The empty cases are located on the library shelves, in the Playaways section. 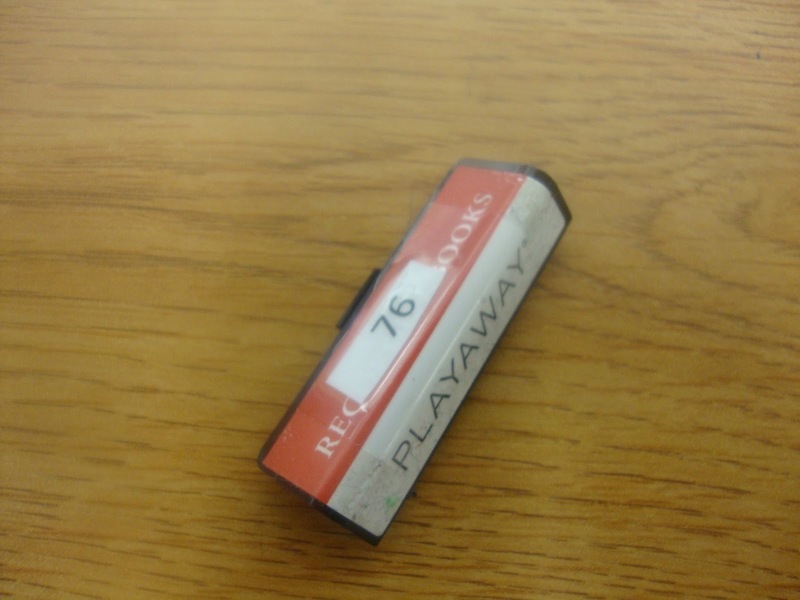 To check out a playaway, the student brings us the empty case, and we put the playaway into the case at the circulation desk. The student keeps the case for storage and returns the playaway inside the case. 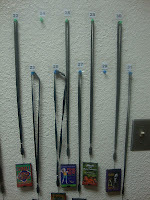 Further, the students can tell at a glance which playaways are available for checkout. If the empty playaway case is on the shelf, the playaway is available. Students would return the book without the playaway or vice versa. This happened more often than you'd think. The library copy of the book would be checked out, and students would check out the playaway simply to get the book. So now, students check out the book and playaway separately. Yes, this does occasionally cause problems when the book happens to be checked out. It hasn't happened a lot, but it has happened. Needless to say, I am not happy with my current playaway/book/kit? system, either. If anyone has suggestions for this dilemma, I would love to hear them! BATTERIES, BATTERY DOORS, EXTRA CASES: I keep AAA batteries on-hand at all times to replace worn-out playaway batteries. We check the power level of every playaway when it is checked out. If the power level bar is down to one (three bars is highest), we put an extra battery in the case. We don't want them running out of power in the middle of a good part! We also keep a few battery doors on-hand. We have had one battery door go missing and one break over the years. Follett sells them pretty cheap, and we charge the students 50 cents for lost/damaged battery doors. Follett also sells playaway cases $1.99/case (pre-2010 packaging, not the newer orange ones). Foam inserts for the pre-2010 packaging cost $2.99. We bought two cases and two inserts a couple of years ago, but we have not had to use them yet. HEADPHONES: Many of our students have their own headphones or earbuds, so we do not automatically give them to students who checkout playaways. We do always ask if they need them. If a student needs earbuds, we give them the first pair free. We put it in a Ziploc snack baggie, labeled with the student's name. In one of our trusty "User-Defined" fields in Destiny, we put the date we issued headphones to the student. If the student never returns the headphones, that is fine. They won't get another pair from us. If they do return them, we store them alpha by last name in a plastic storage bureau (looks like a miniature clothes dresser). We issue a set of earbuds to only one student, and it becomes their pair for life. Lots of librarians do sanitize and reuse their earbuds, and that is their choice. I don't want to deal with it though. I buy my earbuds from Follett in packs of 50 for $64.99. I would love to hear your experiences managing playaway checkout! If you have a good tip or a problem our community might help with, please post a comment! Your blog post couldn't have appeared at a better time for me! I will be presenting at the South Carolina Association of School Librarians 2012 Conference this week. My session is entitled "Ramp Up Reading with Technology." I first presented it to a diverse group of educators in the summer of 2011 at the Upstate Technology Conference, but am revising it for my audience of school librarians this week. 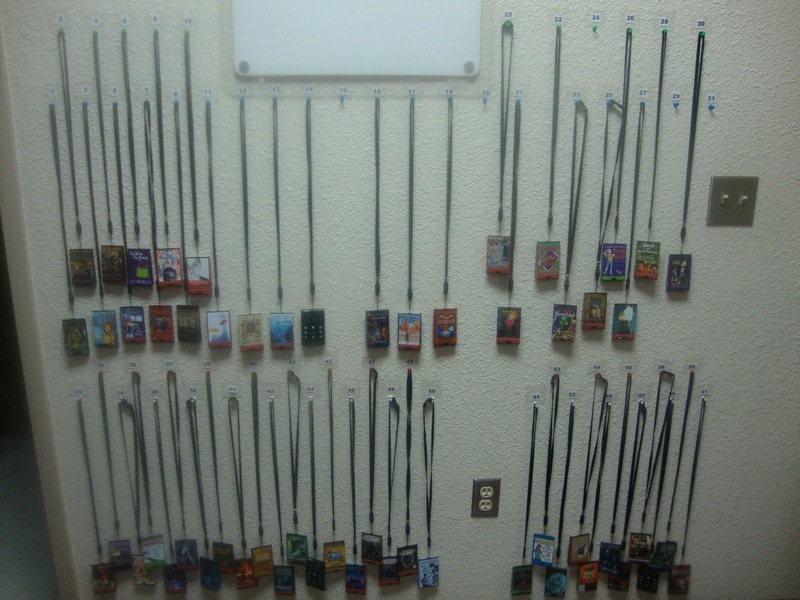 Thank you for sharing how you manage your collection. 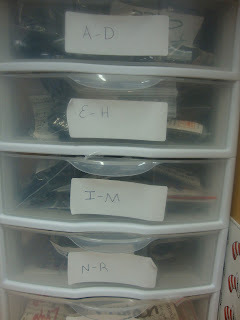 I have a small collection of Playaways now that are using for our ESOL class. You have me considering purchasing more titles and opening the collection to a wider range of students now. So glad to hear! Good luck with your presentation! LOVE the idea of numbering the case and the Playaway. MUCH faster when it comes time for check out. (My student aide heartily agrees too!) I solved the "kit" issue with paperbacks. I purchased a paperback for each of the Playaway titles I have. I created a separate Circulation Type in Destiny called Companion Books and marked it Hidden. 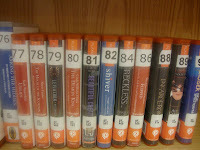 The paperbacks are kept behind the Circ desk. This way, the kids can't see in the catalog that I have another copy of Legend, because it is only available when the kiddo checks out the Legend Playaway. Oooh! I love the Hidden idea for the paperbacks! Hi - Did you ever write the promised blog - How I Managed to Buy 92 Playaways in Four Years? I just started a Playaway collection at my middle school, and read your other posts, so very interested in this topic! Libeary (love that name!) --You are right, I never did write that post! I will try to add it to the list--it's crazy-town right now with this move to China. I've been here two days and am trying to catch up on all my correspondence from the blog. I can't guarantee a timeline, but I will try to get to it soon. Thank you for the reminder!